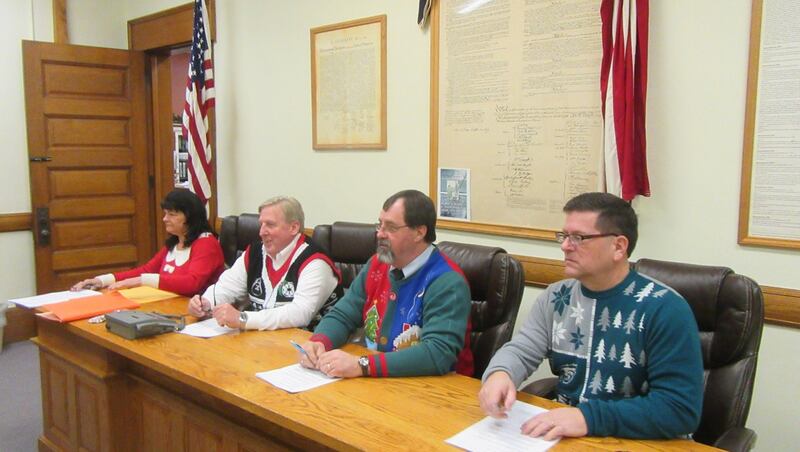 Bradford County Commissioners (from right) Ed Bustin, Daryl Miller, and Doug McLinko and Chief Clerk Michelle Shedden donned ugly sweaters for the last public meeting of the year held Thursday morning. 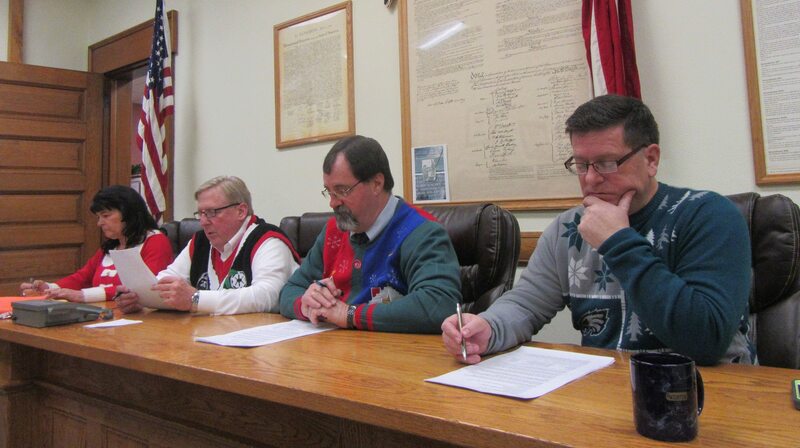 As their second order of business on Dec. 22, the Bradford County Commissioners approved a $76,093,007 budget and 2.5 percent pay increase for all county employees and set the county real estate millage at 10.43. Chairman Doug McLinko thanked county fiscal director Mike Soprano and accounts supervisor Dan Thorp for their diligence in working with all of the county departments to achieve a sound budget. Soprano noted that the $76 million is about $3 million higher than the 2016 budget and that the pay increases are smaller this year. “Where it needs to be bare-bones, it is,” said McLinko, adding that the budget also contains “great new things” for the county without a tax increase. Among the substantial new projects will be developing plans for a new communications center to be built on the same property on which the current center is situated in North Towanda. The county has been considering construction of a new communications center and fire and police training facility for several years. Due to inconsistencies in the amount of impact fee funds received by the county each year, the commissioners have been reticent to commit to the full scale project. “This is a good step in that direction,” said McLinko. When asked for a time line on the project, Commissioner Ed Bustin said that he would hope that ground will be broken by the end of 2017. “A lot of things need to be done before that,” Commissioner Daryl Miller added. Numerous vendor contracts, meeting schedules, new hires, salaries, and job reclassifications were among the agenda items approved during the business portion of the meeting. The commissioners concluded the meeting on a high note, concurring that the county has an especially dedicated and efficient employee base at this time. “You couldn’t ask for a better county atmosphere in terms of morale,” McLinko remarked. 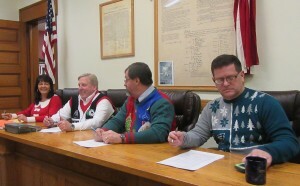 Bustin added that the spirit of the county employees was evident at a Christmas party held at the courthouse the previous day that included a door decorating contest. Daily Review reporter James Lowenstein questioned the job reclassification process and asked if county employees whose positions had been reclassified will also get the 2.5 percent raise, as reclassification generally results in an elevated pay rate. McLinko said that they will not get the 2.5 percent raise and further explained that reclassification is more about the position than a person. “We look at injustices in pay,” he noted, conceding that an employee’s performance in a particular position can influence the reclassification. This reporter noted that, comparably, the Bradford County commissioners are much more transparent about hires, transfers, promotions and salaries than some in adjacent counties. The salaries of the employees in question were in fact printed in today’s meeting agenda. Rocket-Courier reporter Cane Chamberlain and I agreed that such information is never made public in Wyoming County. I asked for an update on the commissioners’ sound rebuke at the Dec. 8 meeting of the State Auditor General’s report suggesting that Bradford County was among counties misusing impact fee disbursements. Though the commissioners eluded at that time that some sort of formal response would be issued, Bustin said that he didn’t feel a need to further comment on the report. “It’s a county issue – not a state issue,” he stated. “The money comes from this county to begin with,” Miller agreed. McLinko, who noted that the county solicitor continues to monitor impact fee spending as per the guidelines given to them by the state, repeated that the State Auditor General should be more concerned about the $500 million leaving the county via natural gas companies and disputed post-production costs. Bustin was pleased to announce that Bradford County was among 13 Pennsylvania counties earmarked to receive a portion of $1.5 million to provide Vivitrol for prisoners battling addiction. Known generically as extended-release naltrexone, the drug is injected monthly and suppresses both the cravings for and painful withdrawal from heroin and prescription pain medications. Probations Officer Justin Popovitch submitted the application for the grant in August. The program represents another step forward for a county that took a strong stand against drug addiction and the stigma afflicted on its victims in May with a large rally on courthouse grounds. At that time, the commissioners and those involved with law enforcement concurred that providing effective treatments to those addicted made more sense than sentencing and cold-turkey detoxing. When asked if the commissioners felt the addiction and opiate crisis had abated since the May rally, they agreed that success was difficult to quantify. “I think that the people of Bradford County are doing everything they can now to fight addiction,” he added. “If one less family has to deal with the loss of a loved one, there has been some success,” said Miller. McLinko commended Bustin for his compassion for the issue and for sharing his understanding of the situation with him and Miller.